1. Preheat the oven to 220°C, gas mark 7. Heat the oil in a large frying pan and fry the chicken for 5 minutes until cooked through, then pour off any excess oil. Add the gravy and sweetcorn to the pan and bring to the boil. Transfer to an ovenproof casserole dish and cook, covered, for 20 minutes. 2. Meanwhile, tear the garlic bread into chunks and add 3 tbsp water. Mix with your hands to bind together then mould into 4 balls. 3. Add the spring greens and beans to the casserole and cook, covered, for 10 minutes. 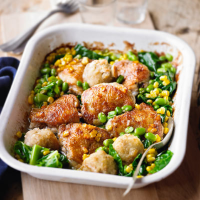 Remove the lid and add the dumplings to the casserole, pressing down slightly. Cook for 10 minutes until golden.